For Disney phones, go to the Disney Telephones Page. 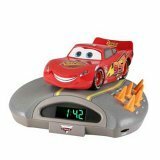 By Target Model of Lightning McQueen reigns supreme on chrome trim base with integrated alarm clock. 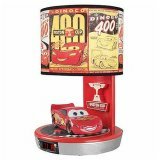 Decoupage shade displays images from Disney/Pixar�s film "Cars". Features wake to alarm/voice, LCD alarm clock display with backlight, snooze function. Zippy accent lamp offers racing appeal. 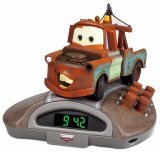 For more products featuring Lightning McQueen, Tow Mater, and the rest of the gang from Radiator Springs, go to the Disney's Cars Toys Page or the Disney's Cars Books Page. 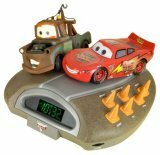 By KNG America Wake up on track with this delightful clock/radio inspired by the new Disney Pixar movie Cars. The radio features detailed replicas of the hotshot rookie racecar, Lightning McQueen and trusty tow truck, Mater. 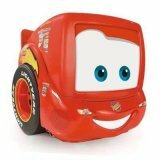 Wake to fun-filled movie phrases delivered by the authentic voices of McQueen and Mater or choose the alarm or radio. Features a backlit LED display with large easy-to-read digits. Press the orange roadside cones to snooze, hear demo dialogue or listen to your favorite station with the digital scan FM tuner. Measures 9 1/2" x 9 3/4" x 5 1/4" and weighs 2 lbs. Plugs into standard outlet with included AC adapter. 90-day warranty. 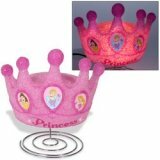 Disney Princess Crown Lamp Top off the decor off in your little princess's bedroom with this magical crown lamp. It features images of all her fairytale favorites like Cinderella and Belle. Lamp includes a 7-watt-maximum candelabra-base bulb. UL listed. Crown is not to be worn. Measures 7.5" tall. For Disney Princess toys, go to the Disney Princess Toys, Games, and Dolls Page. 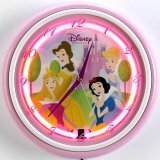 By KNG America The Collectible Electronics bright colored neon inside the clock illuminates vibrant original graphic illustrations from Disney! On/off switch for the neon light. Clock is battery operated (battery not included), neon is electrically powered. 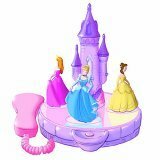 By KNG America What little princess wouldn't love this animated telephone? With the touch of a single button, favorite Disney princesses Belle, Cinderella, Sleeping Beauty and Snow White dance around a lavender castle; authentic character voices are built in, so you'll hear their royal highnesses as well as see them dance when the phone rings. Simple switches allow you to turn the sound off if it's time for all the princesses to go to sleep; users can also select a conventional ringtone. The corded handet�attached to the side of the base--is hearing aid compatible, and includes last number redial and volume control. It's also switchable between tone and pulse dialing. Four C batteries (not included) are required to power the animated features. 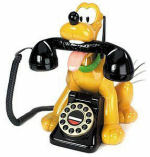 For a complete assortment of Mickey Mouse telephones and more, go to the Disney Telephones Page. By KNG America Princess Carousel Lamp, Beautifully decorated Princess lamp featuring Sleeping Beauty, Cinderella and Snow White. Princesses ride up and down on a carousel ride with music and Princess dialog when lamp is turned on/off. 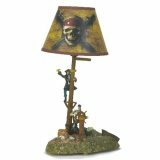 Mickey Mouse Action Animated Lamp This adorable lamp features animated and talking Mickey Mouse. Press a button and watch as Mickey pulls the lamp chain to turn the light on and off. 40-75W light bulb not included. Press button and watch as Goofy pulls the lamp chain to help you turn the light on and off. Goofy moves and speaks 8 different phrases. 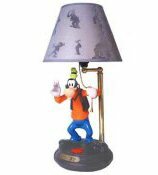 Beautiful decorator lamp featuring Disney's classic Goofy character. By KNG America Simba pulls the chain to turn the lamp on or off while Pumba fans him, Timon hangs from the chain- Plays a song when the light is turned on/off- Displays Lion King graphics on lamp shade- Demo button- Sound on/off feature- Uses 40-75 Watt bulb (not included)- Pumba, Timon, and Simba lounge on a grassy base beneath a lamp shade- Characters are shown in their traditional colors- Approx. height: 17"" "
By KNG America Animated Tinkerbell Sways back and forth and bends, Plays Disney "Fairy" with light switch or demo button. Tinkerbell is featured in a flower garden. Demo button. Sound on/off feature. 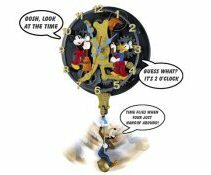 Mickey Mouse Animated Talking Wall Clock Battery operated wall clock was inspired by the 1937 Disney cartoon "Clock Cleaners". Features the Disney characters Mickey, Donald, and Goofy. Requires 4 - D and 2- AA batteries (not included). By Memorex The ideal accessory for a child's bedroom or play area, Disney's classic-styled 13-inch television from Memorex is equipped to field everything from VCR, DVD, and gaming-console hookups to television content policing (through V-Chip control). The set's high Disney fashion derives from its fun shape, detachable "feet," and detachable speaker "ears." The set also includes an entertaining, customized Disney-designed user interface. A monaural earphone jack affords private listening--great for those Saturday mornings when mom and dad are ready to sleep in--and a sleep timer comes in handy for enforcing limited-duration use. Connections consist of front- and rear-panel audio/video hookups (monaural RCA audio with RCA composite-video). A snazzy Disney logo enlivens the front panel, and kids will love the buttons arranged in the famous Mickey Mouse silhouette. Other features include a trilingual onscreen display, closed-caption decoding, channel return, memory channel backup, and a full-function remote control. 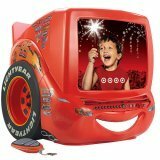 18.9" x 17.3" x 21.3"
By Hannspree Add a unique television with a touch of fun to your child's room with Hannspree's Cinderella's Coach 10-inch LCD TV. Shaped like the white pumpkin coach that took Cinderella to the ball, this cabinet is accented with embossed and textured silver wheels that support the floral-patterned pedestal, which acts as a stand for the TV (it can also be detached for mounting on a wall). The back of the set features Prince and Cinderella graphics. It offers a standard NTSC television tuner and such features as V-chip parental controls and closed captioning. The 3-line digital comb filter helps to improve detail, clean up image outlines, and eliminate extraneous colors by comparing three scanning lines within a field of video. Other features include DCDi (Directional Correlation Deinterlacing) digital enhancement for improvement of low-resolution images, highly accurate 10-bit video processing, and ADC and gamma correction technologies. The screen has an estimated lamp life of 30,000 hours, which translates to over 12 years with six hours of usage per day. This TV has a pair of built-in stereo speakers that produce 2 watts per channel (4 watts total). It includes a 4-in-one video input--which accepts S-Video and RCA A/V connections--as well as an RF input, enabling you to easily hook up a DVD player or VCR. It also provides a headphone jack for private viewing. It comes with an easily gripped, contoured remote control. By Memorex Every Princess needs her own TV and the Disney Princess 13 inch Color TV is perfect for your little princess. Comes with "Tiara-Shaped" speakers. Custom princess on-screen user interface. Cinderella, Snow White and Ariel make operating your TV fun! Front and rear A/V jacks make it convenient to hook up a VCR, camcorder or video game. Detachable feet. Can be used with Disney Princess DVD player (DVD player sold separately). Sleeper timer function turns off your TV automatically in case you want to fall asleep watching TV. 181 digital channel tuning. Closed caption decoder. V-chip function. Remote control included (requires 2 AA batteries not included). By Hannspree Get ready to head to infinity and beyond with the Hannspree Buzz 10-inch LCD TV, which is enclosed in a unique cabinet evoking Buzz Lightyear--star of Disney's Toy Story movies. This uniquely designed TV is perfect for your child's room. 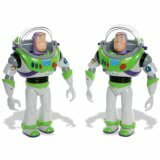 The cabinet is shaped like Buzz's spherical helmet with an adjustable face shield and rubber-clad boots to stabilize the set. It offers a standard NTSC television tuner and such features as V-chip parental controls and closed captioning. 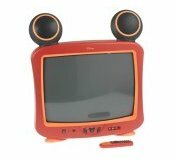 By Hannspree Add a unique television with a touch of fun to your child's room with Hannspree's Disney Pooh Bear 10-inch LCD TV. This foldable, easy-to-carry set has a white front cabinet accented by Pooh logo and colorful, large buttons (perfect for tiny fingers), as well as a large, three dimensional face of Winnie the Pooh on the back. It offers a standard NTSC television tuner and such features as V-chip parental controls and closed captioning. 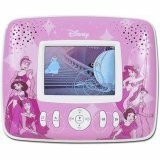 Disney Princess 3.5" Portable Personal DVD Player Your own personal DVD player! This player offers high quality picture performance on the 3.5" screen and superb sound quality with the built-in speakers - or use your headphones for private listening! 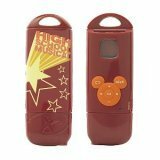 The built-in rechargeable battery makes it easy to watch your favorite Disney movie or listen to CDs anywhere you go. 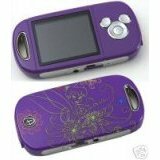 Disney Flower 3.5" Portable Personal DVD Player Your own personal DVD player! This player offers high quality picture performance on the 3.5" screen and superb sound quality with the built-in speakers - or use your headphones for private listening! 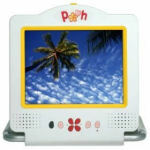 The built-in rechargeable battery makes it easy to watch your favorite Disney movie or listen to CDs anywhere you go. By Memorex DVD player with 4-Head HiFi VCR. Custom Disney Classic DVD screen saver and startup screen. Includes adult and simplified "kids" remote control. S-Video Output. Parental Lock Function. By Memorex The ideal accessory for either a living room or a child's bedroom or play area, Disney's red, Classic-styled DVD/CD player from Memorex is equipped to handle DVDs, CDs, homemade audio CD-Rs and CD-RWs--even content policing (parental locks let you prohibit specific DVDs). The set's high Disney fashion derives from its fun shape and cute, detachable yellow "feet." The player also includes an entertaining, Disney-designed screen saver and customized onscreen user interface. For added convenience for both parents and children, the player comes with not one but two remote controls: a full-function model and a simplified one for the kids (offering power, play, pause, stop, and forward and reverse chapter-skip buttons). A snazzy Disney logo enlivens the front panel, and kids will love the buttons arranged in the famous Mickey Mouse silhouette. Other features include a choice of composite- and S-video outputs, Dolby Digital 5.1-channel surround output (for use with a a full-featured audio/video receiver), picture zoom, and multi-speed playback (forward/reverse). By Memorex DVD player with 4-Head HiFi VCR. Custom Disney Princess DVD saver and startup screen. Includes adult and simplified kids remote control. S-Video output. Parental lock function. By Memorex Every Princess needs her own DVD player and the Disney Princess DVD Player is perfect for your little princess. Plays DVDs, CD-R/RW, audio CDs and Kodak picture CDs. Custom princess on-screen user interface. Cinderella, Snow White and Belle make operating your DVD Player fun! S-Video output for superior picture quality. Wide-screen picture select allows you to watch 16:9 or 4:3 format movies the way they were meant to be viewed. Parental lock function prevents children from viewing unsuitable material. Slow motion function. Multi-angle menu plus zoom function. Two remotes included. Simplified kid's remote uses 2 AA batteries. Full function remote uses 2 AA batteries. 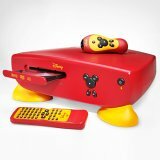 Disney Dream Desk PC Although designed just for kids, the Disney Dream Desk PC built has grown-up capabilities. Standard PC hardware and software from such well-known brands as Intel and Microsoft help ensure the highest levels of performance, reliability and compatibility. They also provide flexibility for your childs unique needs. You can connect existing peripherals to the USB ports and other standard PC connections. An internal modem and network port make connecting to dial-up or broadband Internet services a breeze. Plus, you can add any software that is compatible with Microsoft Windows XP operating system. And, with the 3-D graphics power of the ATI RADEON TM 9100 PRO IGP graphics, the whole family can enjoy exciting 3-D games and educational applications. The multimedia keyboard with hotkeys that go directly to Dream Desk software is easy for kids to use. They also have the option of using the ergonomically designed kid-sized mouse or the optical pen that allows them to use and develop their drawing skills. Pre-loaded with Fun and Functional Software: Whether they enjoy drawing, creating music or writing and directing their own movies, the fully loaded software of unique and creative Disney applications, plus Microsoft Works 7.0 and fun Disney games will let their imaginations run wild! To ensure their safety, the Dream Desk PC also includes the ContentProtect Home Suite, which provides total Internet and email protection and spam and pop-up blocking. 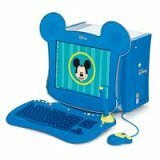 Included Software ContentProtect Home Suite Microsoft Works 7.0 PowerDVD 5 Nero Express 6 Disney Games Disneys Mahjongg Disneys Extremely Goofy Skateboarding Disneys Adventures in Typing with Timon & Pumbaa Disney Dream Desk PC Creative Software Disney Flix Disney Pix Disney Mix Monitor Not Included. Disney Dream Desk Monitor and other accesories available separately. 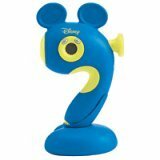 By Toymax Everyone's favorite Disney characters are together on one easy to use controller. The Disney 5-in-1 TV Games is a "plug and play" gaming system that contains 5 classic Disney characters in one joystick that plugs directly into your TV. The lightweight, compact, all-inclusive controller allows gamers to play video games anywhere there is a TV with ATV input jacks. No gaming console is required. Play as some of Disney's most popular characters like Donald Duck, Lilo and Stitch and Aladdin in great games like Donald's Disney Golf Tournament, Stitch's Search for Lilo and Aladdin & the Gems of Agrabah. Other games, like Timon to the Rescue and Simba & the Tree of Trials, feature your favorite characters from The Lion King. Bringing the magic of Disney home has never been so easy! 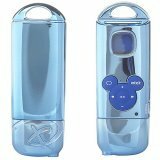 By Memorex Disney's exciting classic-styled DCD6000-C portable radio from Memorex offers cool Disney fashion that kids will love alongside great CD and radio functionality. It delivers full compatibility with homemade audio CD-Rs and CD-RWs, 45 seconds anti-skip protection, and drift-free digital PLL tuning with a 20-preset memory to simplify radio operation (10 FM, 10 AM). Twenty-four-track CD programming and random/repeat play make it easy for users to play favorites. The DCD6000-C's portal-like LCD screen features custom two-tone Disney animation and offers clear indicators for CD track, radio station, preset number, reception strength, and battery level. Kids will enjoy the unit's large buttons arranged in the famous Mickey Mouse silhouette. The included stereo headphones have their own volume control, and their wrap-around design won't impede movements or get tangled in hair. Bass boost heightens the impact of most CD and radio programming when desired. 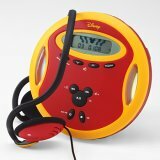 A snazzy Disney logo crowns the CD player's traditional red and yellow coloring. The unit runs on two AAA batteries (not included). For Disney karaoke CDs, go to the Disney Karaoke Songs Page. By Memorex Turn up the fun! Magical Sights! Large, easy to read analog style face. Rotating bezel for quick radio station selection. Magical Sounds! Wake to buzzer or your favorite radio station. Plus Snooze function! By Memorex It's easy to climb out of bed in the morning when Mickey Mouse is calling to you. 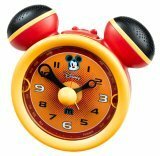 The Disney Classic Clock Radio uses the voices of 5 different Disney characters as the alarm sounds. Other features include large, easy-to-read LED display, snooze and sleep timer. Features digital AM/FM radio with 20 presets. Classic Disney red-and-yellow design and Mickey Mouse control buttons add to the magic. By Memorex Kids will love Disney's Buzz & Beyond-styled DCR5000-B clock radio from Memorex. As fun as it is useful, the DCR5000-B offers large buttons arranged in the famous Mickey Mouse silhouette, AM/FM stereo tuning, 20 station presets (10 FM, 10 AM), drift-free digital PLL tuning, an easy-to-hit snooze button, and a choice of five different Disney Buzz & Beyond custom sounds. The DCR5000-B's green-digit LCD screen is easy to read at 0.9-inches tall. Snazzy Disney and Pixar logos bring flashes of red to the radio's white body, which also has green and purple accents. The clock runs on standard AC power (120V, 60 Hz) and uses two AAA batteries for setting backup (not included). By Telemania If your favorite dynamic Disney characters are Mickey and Minnie, you're in luck. This animated phone will be a delight to use because Mickey and Minnie move and talk to each other when the phone rings, or with the press of the demo button. Plus, Minnie kisses Mickey and the heart lights up and blinks. In addition, they speak in 5 custom phrases in their original character voice. Get this for the mouse-fanatic in your life. 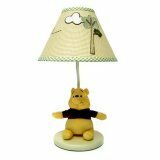 Classic Pooh Hand-Painted Lamp Base Let Winnie the Pooh cast some warm light in the nursery with the Classic Pooh Hand-Painted Lamp Base. 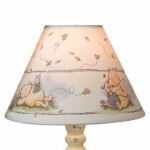 This hand-painted, wood base features fun images of butterflies, bumblebees and Pooh himself. Perfect with the Classic Pooh Lampshade (sold separately). Coordinate with other Classic Pooh Collection items (sold separately). Wood. 11Hx5Wx5D". 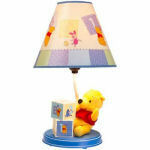 Classic Pooh Lampshade Let Winnie the Pooh and his pals cast some warm light in the nursery with the Classic Pooh Lampshade. 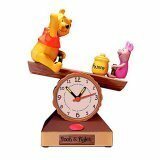 This charming shade features different depictions of Pooh characters frolicking in the Hundred Acre Wood. 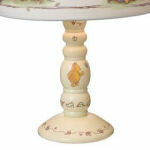 Perfect with the Classic Pooh Hand Painted Lamp Base (sold separately). Coordinate with other Classic Pooh Collection items (sold separately). 7Hx10Wx10D". By Dolly From the Disney Baby Collection. Starlight Mickey Nursery Lamp with Nightlight. Need a night light? Need a lamp? This product is both in one! Mickey Mouse, Minnie Mouse and Pluto decorate this dual function lamp that adds a splash of color to any room. The night light inside the base can function alone or at the same time as the lamp portion. Coordinates with Starlight Mickey bedding and accessories. Requires a 60 watt maximum standard light bulb (not included). Measures 9" x 15" high. A kick for kids and nostalgic baby boomers, this two-slice toaster toasts Mickey Mouse's face into each slice and plays the Mickey Mouse Club march when toast pops up. And that's not all--the dial for selecting from five settings offered by the electronic browning control is in the shape of Mickey's white glove, and the lift control is Mickey's head. But even that's not all. The stainless-steel center of the toaster's retro housing is flanked by cast-aluminum ends showing cutouts of Mickey. Heavy, rugged, and firmly planted on doughnut-shaped black feet, the 800-watt toaster performs as well as it poses. Its large slots (5-1/4 by 1-1/4 inches) accommodate thick bread, bagels, and English muffins. A defrost setting provides extra toasting time for frozen items. And the toast-lift rises high enough to safely extract small items. There's a slide-out crumb tray and a lighted on/off switch. (A switch in back eliminates the Mickey Mouse Club march unless it's switched back on.) The toaster measures 11-1/4 inches wide, 9-1/4 inches high, and 9-1/4 inches deep and carries a one-year warranty against defects. 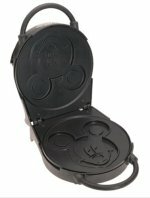 For a complete assortment of Disney kitchen appliances and bakeware, go to the Disney Kitchen Page. VillaWare Disney Pooh Toaster toasts Pooh and Tigger's face onto each slice and plays the Winnie the Pooh theme song when the toast pops up. Extra wide slots for bread and bagels. Electronic browning control with 5 settings. This dandy waffler is a hoot and turns out perfect waffles every time. The clever ready light signals when the waffler is ready for the batter and again when the waffle is cooked just right, so there's no guesswork. The waffler also comes with a terrific little booklet that gives clear directions and some tasty recipes to get you started. It should only take you a waffle or two to get the hang of how much batter to pour into the grid and how to smooth it evenly over Mickey's face and ears. To lift out a perfect Mickey, be sure to loosen the ears first and work down the waffle from there. And always flip it over onto a plate: the bottom of the waffle is Mickey's best side. When your waffle feast is done, cleanup is a snap; the silicone nonstick surface really works. If a bit of batter does stick, just dab on some cooking oil and leave the waffler overnight. The next day it will wipe clean with a paper towel. The waffler was designed to stand on end for convenient storage, but we think it's a knockout and should be displayed on the kitchen counter for all to see. This dandy waffler is a hoot and turns out four perfect waffles every time. The clever ready light signals when the waffler is ready for the batter and again when the waffle is cooked just right, so there's no guesswork. The waffler also comes with a terrific little booklet that gives clear directions and some tasty recipes to get you started. These waffles would be a perfect treat for a children's birthday party. It should only take you a waffle or two to get the hang of how much batter to pour into the grid and how to smooth it evenly over Mickey's face and ears. To lift out a perfect Mickey, be sure to loosen the ears first and work down the waffle from there. And always flip it over onto a plate: the bottom of the waffle is Mickey's best side. When your waffle feast is done, cleanup is a snap; the silicone nonstick surface really works. If a bit of batter does stick, just dab on some cooking oil and leave the waffler overnight. The next day it will wipe clean with a paper towel. 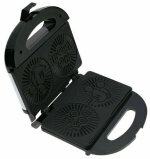 For storage, just stand the waffler on its side and tuck it into a cupboard. Or display it on a shelf--we think it's too nifty to hide! VillaWare Disney Pooh Waffler bakes two classic American waffles with Pooh's and Tigger's faces. 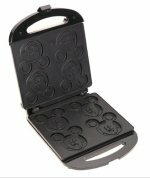 Operating like a waffle iron, this appliance bakes two 5-inch-round, thin, crisp waffle cookies that have Mickey Mouse's face imprinted on one side and an exuberant "Oh Boy!" on the other. The cookie baker comes with six recipes, each of which will inspire variations to prevent boredom. (The basic recipe is for pizzelles, the traditional Italian waffle cookies.) Like a waffle iron, the cookie baker features nonstick baking grids and a ready light to signal when it's hot enough to bake. For safety, a guard protects against escaping steam. Housed in chrome and black plastic, the baker displays an etching of Mickey on its chrome band. A clip locks the handle during baking, also allowing you to store the baker on end. The baker measures 9 inches wide, 4 inches high, and 9-1/2 inches deep and carries a one-year warranty against defects.